When activating this card, your opponent cannot check cards in the Graveyard. Your opponent calls the name of the first monster card found at the bottom of your Graveyard. If he/she call it right, the monster is removed from play. If he/she call it wrong, the monster is Special Summoned on your side of the field in face-up Attack or Defense Position. Pharaonic Guardian introduced some new recursion cards to the game, and this is one of them. 1. The bottommost monster in your Graveyard might be a monster you don't want to revive. 2. If they call it correctly, that monster is gone for the rest of the game. This card actually isn't that bad. I've seen it used with moderate success. I will use the rest of the review to address the issue of shuffling your Graveyard to manipulate Question. If you do this during a tournament, you should get kicked out of it. It's ranked among the most unethical things you can do during a game. If you have to resort to that to win, then I truly feel pity for you. If you can get it to work, by all means use it. Possibly one of the most underrated cards in the set. If you're playing Sealed Deck with a couple boosters, this will give you a second recursion card. If you're just drafting with boosters, this may be the only recursion card you'll see. Yeah, I've finished settling in and now I'm back. If your looking for competitive reviews of upcoming cards, I'm your guy. Question. What a god-awful version of Monster Reborn. Against average players it can be almost as effective as a Monster Reborn. But, if it ever got the slight bit popular, people would just pay more attention to the names of discarded Monsters. Thus making it useless 90% of the time. Experienced players should have no problem against this card. Many of the better players constantly check your opponent's Graveyard. Not only do they check their opponent's Graveyard when they are about to play Monster Reborn, but they will also check to see what cards your opponent has already used and what they possibly have left in their deck and/or hand.. This is an excellent strategy that usually will give you the necessary edge to make near-perfect plays. And as we all know, the best strategies give you the best chance at winning games. One other thing that some you guys might not know. According to the Upperdeck Rules guys, you are not allowed to rearrange cards in your Graveyard. Doing so is considered cheating. Keep Question in your trade binder. Dark Umbreon Well today's CoTD is Question. Question in essence allows you to force your opponent to guess the bottom monster card in your graveyard. If he guesses right, its removed from the game. If he guesses wrong, you get to Special Summon it on your side of the field in face up ATK or DEF mode. Question is really a different card. If your opponent is someone who remembers everything about the duel, then you may end up with a lost monster. But if you're like other people who don't remember what they had for breakfast, you might end up with another monster on your side of the field. 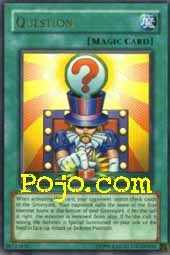 A few variables make Question either a good card or a bad card. Your opponents memory being one of them. Another is the fact that the monster that died first may not be a very good one. If its a Flip effect, its probably not going to use its effect again without outside help. But, monster advantage is always helpful in this game. For an UR, I'd say Question is pretty risky. It can be a last ditch attempt, but it might not work and depends too much on your opponent. Well, playing this card in your deck is probably not a good idea, unless it is filled with Tribute monsters. And it is incredibly easy to counter. When I'm dueling, I always take note of my opponent's bottom monster, so Question would only help me by removing it from the game. If you're playing a stupid or inexperienced duelist though, it may work. Plus, sometimes you can't control which monster will end up on the bottom, like if the opponent plays Confiscation. Rating: 1/5. If you play a smart opponent, it will never work. Now, do you want to play a card that will never work? I didn't think so. But here's an idea! Play 3 Question and purposely remove your own monsters, then have Fiber Jar flipped multiple times! That way, the opponent's Raigeki or Change or Heart will be useless because you won't have any monsters! Awesome!! Now you pwn the opponent with direct attacks from a goat token with United We Stand and Mage Power attached to it! 0 + 2500 + 3200 = 5700 ATK!!1! OMG you win!oneoneoneuno1! Effect: When activating this card, your opponent cannot check cards in the Graveyard. Your opponent calls the name of the first monster card found at the bottom of your Graveyard. If he/she call it right, the monster is removed from play. If he/she call it wrong, the monster is Special Summoned on your side of the field in face-up Attack or Defense Position. Only get to revive the Monster closest to the bottom of the deck. Can be guessed right and the Monster gets Removed from play. Well this card is ok, but now that it's actually out people start paying more attention to what the first monster to land in the opponents Graveyard is, at least I do, The only time I've had this used against me I guessed it right. I'm sure it's good to have some extra recursion besides Monster Reborn and the likes, but when the first card in your Graveyard ends up being a Flip-Effect or low stat Monster it can become pointless sometimes. Also besides the chance of your opponent calling it wrong, they could also negate it to begin with, and the fact that if they do choose correctly then the Monster gets removed from play, and that's never good. Personally I don't care much for this card. It was a Secret Rare in Japan and it's an Ultra over here so I guess somebody thinks it's good. I find it to be too much of a chance and it's too specific on what Monster it revives, if you could pick any Monster after they guess wrong then it would be worth being an Ultra Rare to me. I get by on M.Reborn, Premature and CotH fine for the moment and I'd even use Shallow Grave over this card. ArtWork: 2.0 - It be nicer if that button was "The Button", you know... the one that ends it all, or maybe just for certain counties even. Nice hat though, I'd were it. When activating this card, your opponent cannot check cards in the Graveyard. Your opponent calls the name of the first monster found at the bottom of your Graveyard. If he/she call it right, the monster is removed from play. If he/she call it wrong, the monster is Special Summoned on your side of the field in face-up Attack or Defense Position. Here's a question... Why would you use this card? The idea of getting a free monster onto your side of the field sounds like a good idea but there are so many ways that this card isn't useful. First, let's start with what is good about the card... Free monster = good. Normal Magic (doesn't stay on the field) = good. Uh, that's about all I can think of. Now, let's get to the bad (and really ugly) stuff about the card. Unless your opponent really isn't paying attention, you're most likely going to be removing the monster from play. You probably only have a remote chance of getting that monster if it was put there by discard (like Graceful Charity) since people tend to remember the monsters they destroy on the field. Raigeki and Dark Hole of multiple monsters will also make it harder for your opponent. Getting to bring back just that monster is very bad. Unless you plan ahead, all you might be bringing back is some weakling or a flip effect monster (which won't come back facedown). Then again, it might be one of your tribute monsters. BUT (and it's a very big BUT), if that monster cannot be special summoned (ie. Yata-Garasu, Dark Ruler Ha Des etc), there's no point. We'll have to wait for the ruling to see if it's even legal to activate Question in this situation but even if it is, and even if your opponent guesses wrong, you won't be able to summon the monster. On a side note, it is never legal to shuffle or rearrange your graveyard. Overall, this card is a very bad card and should never have even been a rare let alone an ultra rare. Question is quite a humorous card. This would be a nice pull late game when there's been a lot of blows back and fourth, but in all honesty, if your opponent is any smart, he or she would of remembered the earliest monster sent to the graveyard. There also still is the fact there is no rule against mixing up the cards in your graveyard, so that gives some leeway for this card to slip right in. Here's a trick, act like your looking through your graveyard (Hold it to your face with the back of the cards sticking to your opponent) slide the best monster you got to the bottom, then out of nowhere, BAM. Use question and prey they guess wrong. Yes, this is a dishonest tactic, but if your playing Poker, the whole object of the game is to lie to your opponent, same can apply here. So you shouldn't expect Abraham Lincoln to win any World Championships any time soon. Rating: Lets give this hot tamale a 3.0/5. It's below average because it is the last thing from fool proof, but when it works (which is likely), it gives you a solid advantage. Sealed: I've said this plenty of times, monster advantage wins. Pick it in sealed deck play or draft.